After four years at the helm, MYAC Board Chairman Dale Rudy will transition this summer to a new leadership role as Immediate Past Chair. He will be succeeded by current Executive Committee member Kelly McNamara Corley. A member of the board since 2009 and Chairman since 2015, Dale is a Senior Vice President and Senior Trust Advisor at Northern Trust. Informed by his expertise in the administration of large, complex trusts for individuals and families and his lifelong commitment to the arts and music education, Dale has provided exceptional leadership and support of MYAC for over a decade. He and his wife Melinda reside in Batavia and have three children, including MYAC alum Rebecca Rudy ‘08, who currently serves as the Orchestra Director at Naperville School District 203. We sat down with Dale to reflect on what MYAC has meant to him and his family since his daughter first enrolled eleven years ago. How did you first got involved with MYAC? Our daughter enrolled in MYAC during her senior year of High School. During that year, we quickly came to appreciate all MYAC offers to its students – depth of programs for all ages, top quality ensembles, chamber music, world-class instruction – all with a built-in feeling of community. Why is MYAC important to your family? What has inspired you to support MYAC philanthropically? Music education programs in our schools are very much at risk, under fiscal attack. It doesn’t require a great deal of effort to find headlines about cut-backs in staffing for school arts programs or the elimination of school music programs altogether. MYAC plays such a critical role in the music education process of our students, many of whom have no other opportunities to make music with other students. Melinda and I decided many years ago that it is important for us to financially support MYAC – to do our part to help MYAC stay sustainable. What impact do you think MYAC has had on our student’s lives? When I speak to people unfamiliar with MYAC, they are often surprised to find that only a small percentage of our graduating students go on to become professional musicians. Rather, the real lessons in music education generally -- and at MYAC specifically – is that students learn about how to be a part of something much, much bigger than themselves where their individual hard work and skills are rewarded by the collective ensemble of students producing something magnificent. Of course, these lessons are quite applicable to just about every aspect of our lives. What do you wish other people knew about MYAC? I wish they could see dedication of the staff, parents, volunteers, board members and our generous donors. They so generously give of their time, resources, and talents/expertise. They are very inspirational. 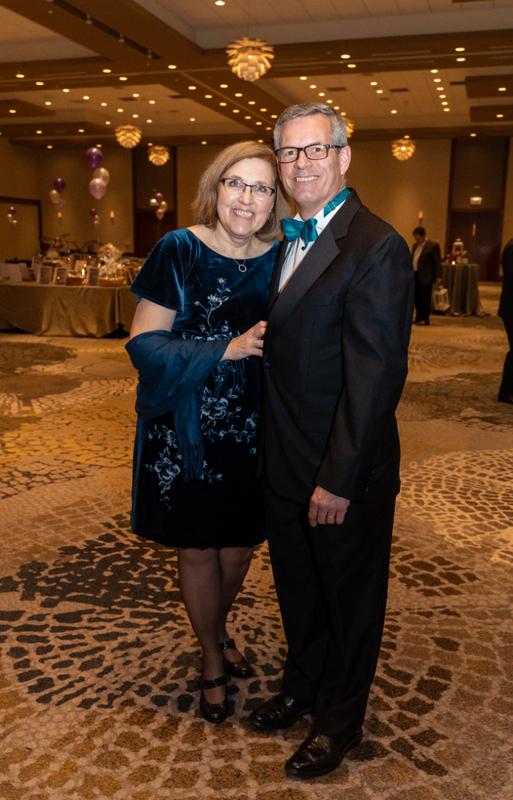 160 guests celebrated Midwest Young Artists Conservatory’s 26th season gala theme "The stories through mUSic”: emphasizing our shared connection through the unspoken language of music on April 6 at the Westin Chicago North Shore in Wheeling. The event raised over $125,000 in support of MYAC’s youth music programs. 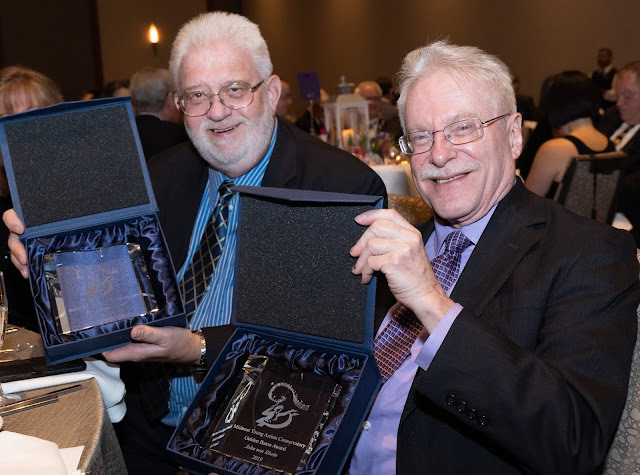 Two local champions of classical music: Carl Grapentine, former host at WFMT radio, and John von Rhein, former Chicago Tribune classical music critic, were honored with the “Golden Baton Award” recognizing their outstanding contributions to the classical music field. Both men recently retired from their posts: Grapentine after having worked in the field for 46 years and von Rhein after writing for the Tribune for 40 years. Student chamber groups, choral groups Voices Rising and Vocal Point led by Mrs. Stevi Marks, and Philharmonia Orchestra conducted by Mr. Patrick Pearson performed during the event’s cocktail hour as guests mingled and perused the wide array of silent auction items available for the evening’s bidding. Guests were called to dinner in the adjacent ballroom decorated with a lush spring floral theme, as a grand “Sound of Music” medley filled the room, sung by a full choir accompanied by the Symphony Orchestra led by MYAC Founder and Director Dr. Allan Dennis. The stories of two graduating seniors, Robert Scherer, bassoon, and Nancy Pulido, double bass, were presented. The teens recounted how MYAC has positively impacted their musical education and their future plans as they now head to college. A rousing performance of selections from “Symphonic Dances from West Side Story” had guests accompanying the orchestra with shouts of “Mambo!” as the full percussion and horn sections deftly punctuated the rhythm of the piece. Following an exciting live auction led by emcee Ron Bernardi, guests were treated to dessert and dancing to the sounds of MYAC’s Big Band jazz students led by Ms. Ashley Summers. Dr. Dennis said he is humbled by the generosity of MYAC’s community of supporters and friends both old and new. In fact many parents of former students who once played and sang in MYAC programs, as well as MYAC alumni themselves now working professionals in industries from medicine to education, engineering, and of course music, continue to support their former “musical home”, and even take the time to visit and reunite with fellow students and faculty, if they can when in town. Co-chaired by Sharon and Mike Mullins, Doris Xie and Derek Han, Tom and Nancy Sharp, Dale and Melinda Rudy, and Allan and Karen Dennis, the event's donations will benefit MYAC’s music education programs. 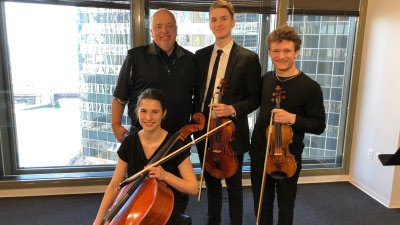 These funds will allow MYAC to continue offering student scholarships to young musicians, as well as continue need-based financial assistance for its signature outreach program Young Music Scholars, ensuring that music education remains affordable to all. 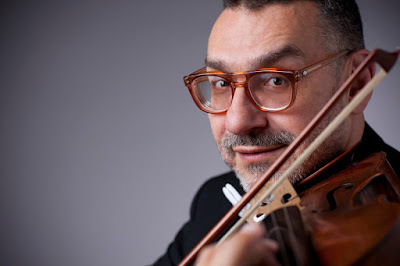 Congratulations to MYAC's very own Mr. Charles Pikler, founder and director of the I'Solisti Chamber Orchestra at MYAC, who was recently awarded for his significant contributions to the music world by two community organizations in his hometown of Norwich, CT. The award "recognizes outstanding achievements by Norwich, Connecticut natives who reached those achievements while living outside the Norwich area." According to a recent article in the The Day, "Pikler was named the 2019 recipient of the Norwich Rotary clubs and Woman’s City Club Native Son Award. The award banquet will be at noon June 5 at the Holiday Inn Norwich. Tickets and event information will be available at bit.ly/NorwichNative."